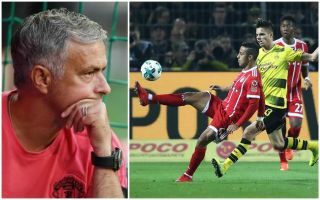 Manchester United look to have been given a big opportunity to seal the transfer of Julian Weigl as his Borussia Dortmund future has been thrown into doubt. The Germany international is being linked with Arsenal at the moment as his form has taken a slight dip in recent times, resulting in him falling down the pecking order of the club’s new manager Lucien Favre. Weigl has been linked with United on several occasions in recent times, with reports suggesting he’d be available for around £66million. One of the finest young midfielders in the world, Weigl has also attracted interest from the likes of Barcelona and Manchester City due to his intelligent playing style. Still, the latest from German source Bild suggests he could be edging ever closer to the exit door, meaning United can now surely follow up on their previous interest. The Red Devils still look in need of a midfielder of that type following the retirement of Michael Carrick in the summer, and the lack of impact made by summer signing Fred. Paul Pogba’s form has also been patchy, while players like Nemanja Matic and Ander Herrera look somewhat past their best for the club.